If you haven't dined in Morro Bay lately, there's a good reason to drive over: The Galley Seafood Grill & Bar. Reopened last December after being closed nearly three years, it underwent a complete rebuilding along the popular Embarcadero. Now the property features an impressive, modern boutique hotel named the new Anderson Inn and the Galley restaurant, the latter a favorite of locals and tourists since 1966. 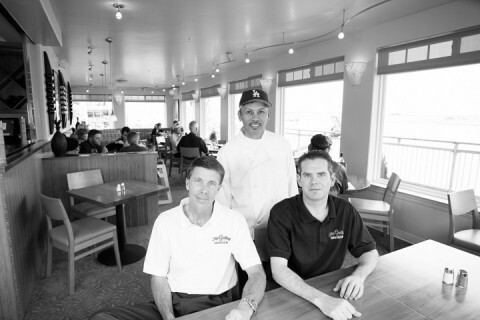 ON DECK : (Left to right) Galley owner and general manager David Peter, head chef Henry Galvez, and manager John Anderson work to serve up quality dishes for Morro Bay tourists and locals alike. 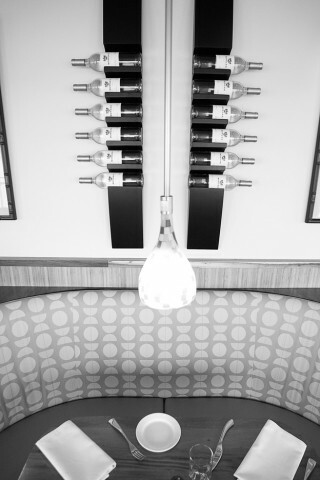 # Although I never dined in the original restaurant, I discovered that the new Galley is well worth visiting for its fresh seafood and well-chosen, reasonably priced wine list. The Galley also features something unusual that its guests benefit from but rarely get to see: a large "19" nailed to the wall on the kitchen-side of the door where the servers and bus people enter the dining room. "It's there as a reminder to our staff that our customers have choices, and that we need to do whatever we can to give our customers a reason to choose The Galley," explained owner and manager David W. Peter. "The number represents the 19 other restaurants that exist on the waterfront alone in Morro Bay. I want this to be the last thing our servers and staff see before they enter the dining room to interact with our guests." "Naked fish" is the theme, and it's a promise that seafood lovers expect. "We've always appreciated fresh fish that isn't mutilated with sauce," Peter explained, noting that he and his wife Aglaja spent two years conceptualizing the old Hawaiian theme. The new menu, created with chef Henry Galvez, offers a wide selection of fish, including ahi, king salmon, Hawaiian ono, and escolar, along with locally caught sand dabs, petrale sole, and white sea bass. No fish cooked here comes to the table drowning in sauce. If you want sauce, the choices are yogurt-dill, classic tartar, and mango salsa, always served on the side so you can add as little or as much as you like. I wish more restaurants did that automatically. I dined at The Galley for lunch and sampled an array of enticing options. The seared scallops in a beurre blanc (butter/wine sauce) were delicious and prepared just as I like them, not too raw, not overcooked. I thoroughly enjoyed the exceptional, crispy-crusted crab cakes, mostly crab (not fillers) with a brunoise (tiny dice) of fresh red bell pepper, served with a side of roasted red bell pepper and herb coulis. Admirably, the cakes were just as delicious without the sauce. # The only thing that disappointed me was that day's soup-du-jour: shrimp bisque. The shrimp were fresh and tasty enough, but the bisque lacked the intensity of flavor and creaminess I expect from this classic pureed-shellfish soup. Peter said that he prefers buying local wild-caught fish from area fisherman. But even when buying from purveyors outside the Central Coast, he seeks out the most reputable of them to purchase the highest quality seafood. For the main course, I ordered the fresh petrale sole, caught by fisherman Ed Ewing on the "Southbay." Perfectly cooked, the delicate and tender filets were served with merely a wedge of fresh lemon. Peter regularly strolls through the dining room, talking to guests to ensure they're content. I admired that about this passionate restaurateur. During one of several visits to my table, he told me that some of their vegetables are grown by their chef, Galvez, at his home in Los Osos Valley. "We're planning to have Henry grow specialty items, like white asparagus," Peter added. "We also support the Farmers' Market. There's so much available locally." The Galley's closure was forced in 2004 when it became one of the many victims of the litigious Jarek Molski. Disabled and forced to use a wheelchair after a vehicular accident, Molski sues businesses (wineries and restaurants up and down the state of California) for alleged violations of the Americans with Disabilities Act (ADA). When it happened to the Andersons, rather than remodel the "ancient" building, Peter said, they rebuilt it all, starting with the concrete pilings under the bay. Bud Anderson, founder of The Galley, first met Peter when he was the entrepreneur's paperboy. Peter recalled Anderson telling him that when he was 14, he could join the family and work at The Galley. Peter has a photo of himself at 14 dressed up with a tie for his first day as a busboy--it can be seen on the TV monitor in the bar. Bud Anderson and his family still own the buildings, and the Peters own the restaurant. Today, Bud's grandson John Anderson works for Peter as assistant manager of The Galley. Ever since the opening of The Galley two months ago, Peter has been pleased to see that it's being received by more than a modicum of hungry diners. Former patrons have packed the small, seaside eatery, seemingly glad to have an old friend back in business. They've discovered that the Hawaiian-themed eatery is still a comfortable place with an island spirit. You can practically count the birds on Morro Rock from the excellent location alongside the bay. The dining room, colored a sunny tropical yellow, features comfortable curved booths and window-side tables. The Peters brightened the walls with brilliantly colored menu covers from Hawaii and wine bottle racks custom-made in Peru. If you live within the city limits of Morro Bay, Peter gladly provides a complimentary ride to the Galley in a cool, turquoise '54 Pontiac Chieftain Tin Woodie. Another fun addition is the TV monitor in the bar where you can watch the chef and his team in action, just like watching the Food Network. But beware, just as you can be sure they're holding to Peter's high standards, the cooking team can see you and your reactions to their food. It's a two-way monitor, so don't be surprised if the cook you're staring at suddenly waves hello. Sign up for Peter's e-mailed newsletter at www.galleymorrobay.com to receive news of the fresh fish on the grill and the new tropical drink night on Wednesdays so you can celebrate the "aloha spirit" at The Galley. This kid-friendly eatery offers foods to delight any picky children. And don't skip the dessert menu: House-made sorbets and chocolate cake provide a satisfying conclusion to any meal at the Galley. The Galley Seafood Grill & Bar is at 889 Embarcadero (at Harbor Boulevard) in Morro Bay, open for lunch and dinner Wednesday through Sunday, and lunch only on Monday. For more information, call 772-7777. You can reach New Times' Cuisine columnist at khardesty@newtimesslo.com.